Synthetic peptide conjugated to KLH derived from within residues 1 - 100 of Human Nucleolin. HeLa (Human epithelial carcinoma cell line) Whole Cell Lysate, Jurkat (Human T cell lymphoblast-like cell line) Whole Cell Lysate, A431 (Human epithelial carcinoma cell line) Whole Cell Lysate, MEF1 (Mouse embryonic fibroblast cell line) Whole Cell Lysate, Brain (Mouse) Tissue Lysate, Pancreas (Mouse) Tissue Lysate, PC12 (Rat adrenal pheochromocytoma cell line) Whole Cell Lysate. Our Abpromise guarantee covers the use of ab22758 in the following tested applications. Nucleus > nucleolus. Cytoplasm. 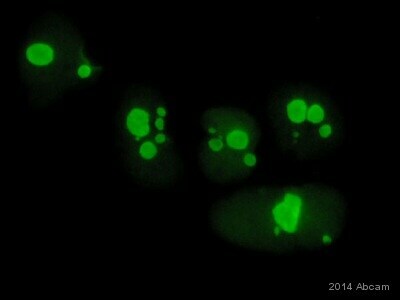 Localized in cytoplasmic mRNP granules containing untranslated mRNAs. ICC/IF image of ab22758 stained human HeLa cells. The cells were methanol fixed (5 min) and incubated with the antibody (ab22758, 1µg/ml) for 1h at room temperature. The secondary antibody (green) was Alexa Fluor® 488 goat anti-rabbit IgG (H+L) used at a 1/1000 dilution for 1h. Image-iTTM FX Signal Enhancer was used as the primary blocking agent, 5% BSA (in TBS-T) was used for all other blocking steps. DAPI was used to stain the cell nuclei (blue). Alexa Fluor® 594 WGA was used to label plasma membranes (red). IHC image of Nucleolin staining in human tonsil FFPE section, performed on a BondTM system using the standard protocol F. The section was pre-treated using heat mediated antigen retrieval with sodium citrate buffer (pH6, epitope retrieval solution 1) for 20 mins. The section was then incubated with ab22758, 1µg/ml, for 15 mins at room temperature and detected using an HRP conjugated compact polymer system. DAB was used as the chromogen. The section was then counterstained with haematoxylin and mounted with DPX. Nucleolin was immunoprecipitated using 0.5mg Jurkat whole cell extract, 5µg of Rabbit polyclonal to Nucleolin and 50µl of protein G magnetic beads (+). No antibody was added to the control (-). Proteins were eluted by addition of 40µl SDS loading buffer and incubated for 10min at 70oC; 10µl of each sample was separated on a SDS PAGE gel, transferred to a nitrocellulose membrane, blocked with 5% BSA and probed with ab22758. ab22758 staining nucleolin in HeLa cells treated with Triptolide from Tripterygium wilfordii (ab120720), by ICC/IF. Changes in nuclear localization of nucleolin (from nuclelous to whole nucleous) correlates with increased concentration of Triptolide from Tripterygium wilfordii, as described in literature. The cells were incubated at 37°C for 1h in media containing different concentrations of ab120720 (Triptolide from Tripterygium wilfordii ) in DMSO, fixed with 4% formaldehyde for 10 minutes at room temperature and blocked with PBS containing 10% goat serum, 0.3 M glycine, 1% BSA and 0.1% tween for 2h at room temperature. Staining of the treated cells with ab22758 (1 µg/ml) was performed overnight at 4°C in PBS containing 1% BSA and 0.1% tween. A DyLight 488 goat anti-rabbit polyclonal antibody (ab96899) at 1/250 dilution was used as the secondary antibody. Do we sell Hybridomas? Bulk order available? Leider handelt handelt es sich bei dem monoklonen Antikörper hierbei nicht um ein In-Haus Produkt, so dass wir das Hybridoma nicht weiterverkaufen können. Des weiteren darf ich Ihnen aus betrieblichen Gründen nicht den Hersteller dieses Antikörpers nennen. Thank you for offering your help in testing the different lots of this antibody with the mouse lung. Certainly, I would like to see if your lab can find out any lot of this antibody that can produce the apical staining that I showed you in my previous email. We have found another nucleolin antibody from Santa Cruz that give us some of the staining we wanted but still didn&apos;t work as well as we expected. Also, since this staining pattern was published on Nature and your antibody was referenced, we would still want to produce consistent results with the same ab22758 antibody. Please inform me when you have the results and I&apos;m looking forward to see if we can get the apical staining back. Really appreciate for your help and please let me know if I might be helpful to provide you additional information to assist your test on the antibody. Thank you again for letting us know about this problem and for your patience while our lab is working with this antibody. My colleagues in the lab have re-tested the antibody in mouse lung tissue, and we have also found that the apical staining is missing when using the most recent lot that you've used. We are currently running a couple of more tests to make sure this can not be optimized. It is now part of our QC criteria for new lots of this antibody to show the apical staining, so this should reduce the lot variability in the future. The lab is also currently testing other lots of the antibody to see if any produce the apical staining, and I will update you as soon as we know whether we have a good lot to send you. Please let me know if there is anything else that we can do for you, and thank you again for your patience. Although the amino acid structure of the protein would predict a size of 76 kDa, it goes through a significant amount of post-translational modification including methylation andphosphorylation which increases the actual size of the protein. The band we have observed with the antibody, as well as the strong specific staining withinthe human HeLa cells shows that the antibody is capable of binding the Nucleolin protein. I am looking for an antibody turned towards nucleolin (in rat and zebrafish). 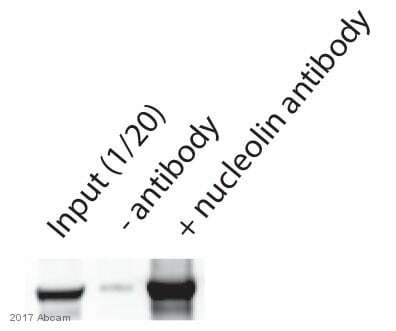 Before purchasing, I am wondering if I could get a small aliquot of this following product for preliminary tests: Anti-Nucleolin antibody (ab22758). Thank you very much for your interest in ab22758. To our knowledge, ab22758 has not been tested in zebrafish. Therefore, I can offer a discount off a future purchase if you buy ab22758 now, test it in zebrafish and submit feedback to us in the form of an Abreview. It doesn’t matter whether the Abreview is positive or negative, we would just really like to receive your feedback. The discount would be to the value of ab22758 off a future order. 1. Reply to this e-mail to let me know that you would like to proceed and test ab22758 in zebrafish. I will then send a discount code. This code must be issued before purchasing ab22758 so please wait for my reply before ordering. 2. Purchase ab22758 either by phone, fax, or online (www.abcam.com). We are always pleased to obtain feedback about our products and any information is greatly appreciated! Even if ab22758 turns out to be unsuitable for zebrafish, you will still receive the discount on your next purchase after your Abreview has been submitted.